Just don’t do it. No matter how she pleads or looks at you with those big blue eyes, or says it’s just for fun, that she just wants to try it. Katie and I went to lunch at Nordstrom’s one Saturday, and afterwards, we went down to their cosmetic department to just look around. On a display case was a new product for “hair mascara.” It came in three bright colors – purple, pink and red. 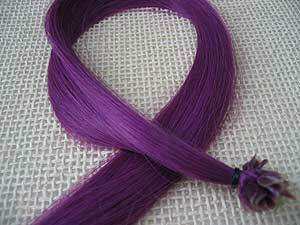 If you ever face the dilemma of your niece wanting to highlight her hair in a bright color, I'd suggest you buy a removable purple hair extension instead! Something sort of told me that this wasn’t something I should do – I was concerned that the dye in the mascara could ruin her long, pretty blonde hair. But the cosmetic clerk said it would easily wash out. So we bought it. Well it didn’t wash out easily. According to her Mom, it took about 3 weeks for the purple streaks to completely disappear. I’m thinking she was a little annoyed with me, but would never have said anything. So I learned if I buy cosmetics or hair care products for my nieces, to replenish items that are already acceptable by my sister-in-laws. However, now and then something frivolous might be purchased just for the fun of it (e.g., silver glitter eyeshadow), as long as it washes off easily. And if you ever face this dilemma as an aunt, you can always just buy purple hair extensions that clip in and out! Because afterall, that’s your prerogative as their aunt! 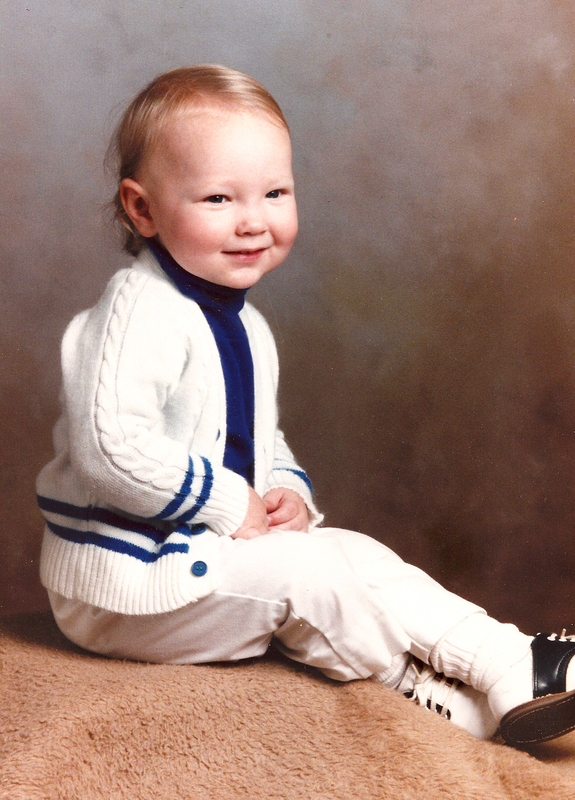 Nick about 2 years old looking very dapper! In 1979, I had moved to Chicago to work at one of the world’s largest ad agencies, and I loved my work, my friends, my life there immensely. While I traveled back to Kansas City for holidays, more often than not, I urged my family to come visit me as Chicago had so much to offer. But something very profound happened to me in the latter part of 1983. On November 1, 1983 I became an Aunt for the first time. Unfortunately, I was not there when Nicholas Michael arrived in this world. 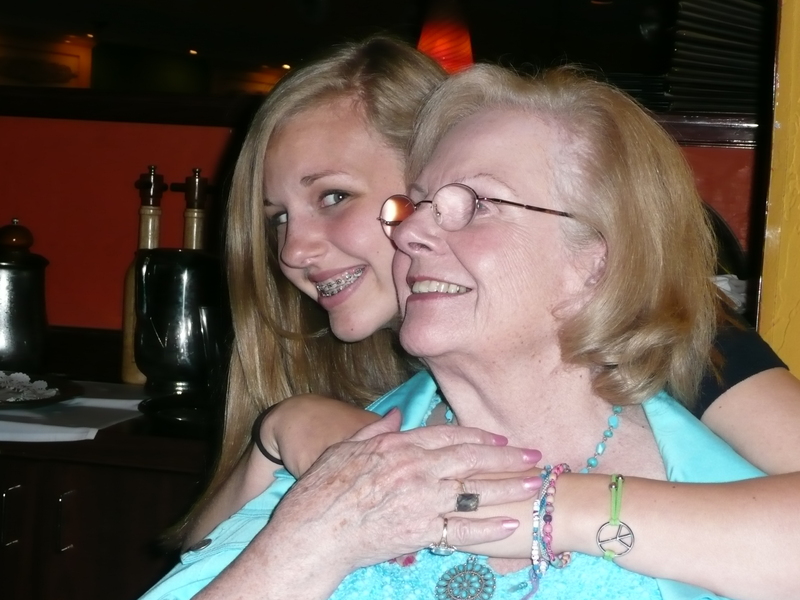 I had to hear about the news on the phone from my Mom, and I was so disappointed that I couldn’t be there to share in my Mother’s joy about being a grandmother for the first time, or my brother’s and sister-in-law’s elation at becoming parents. I held my first nephew for the first time over the Thanksgiving holiday when he was one month old. I came home loaded with presents from Marshall Field’s – blankets, little outfits, cute bibs, stuffed animals and more. I brought a whole second suitcase just to carry everything. He was absolutely, totally adorable. He had big blue eyes that melted your heart and was a wonderful baby in every way. Once Nick arrived, I started coming back to Kansas City more often, about every six weeks. I would hear about how he was growing, talking, walking and missing it all, so I would come home as often as I could. And with Nick’s arrival, I found out about the pure pleasure and fun in shopping as an Aunt. 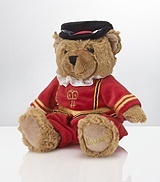 I had gone to London in October of 1984 for business, and shopped at Harrod’s in Knightsbridge buying him a baby blue cotton romper with a matching hat and other cute things and toys for his first birthday. I also visited Selfridges on Oxford Street and picked up a pair of grey plaid knickers with a matching sweater at a children’s boutique on Piccadilly Street. For his second birthday, again at Marshall Field’s, I bought him a camel’s wool double-breasted coat, with the collar, pocket flaps and buttons in brown leather. It had a matching cap, with the bill in brown leather, and came with leggings made of brown leather as well. I don’t know if I started my Aunt shopping frenzy just because that’s what aunts are supposed to do (?) or because I felt guilty, jealous or something else for not being around him as much as my Mom and sister. I guess I worried that Nick wouldn’t get to know me. Many of my friends at the time (also single working women not remotely concerned about getting married or having kids, after all, this was the 80’s) were Aunts and saw their nieces and nephews often because they lived in the same town. Gone was the old cliché of aunts as old maids – the new aunt was hip, had a good salary to afford spoiling, and would take her “weekend kids” anywhere. They were fun to be around and good company. 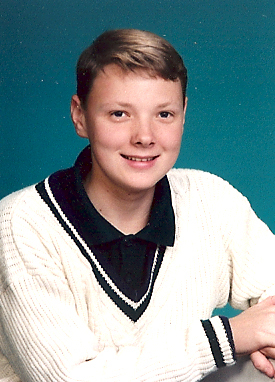 Nick about 14, always looking good! Being an aunt is all about giving – not just your credit card, but giving your time, your wisdom, your love. Aunting is also a special honor and privilege in terms of receiving. They love you not because your family or the gifts that you do spoil them with because you can, but because of that special bond that they have with you. He did know me! He just didn’t know my right name. He thought my name was Chicago! The family deduced that he called me that because when people would talk about me when I wasn’t around it would be with Chicago attached to it. Thus my name to Nick for a year or two was Chicago. It was fine with me. Nick grew up to be a great dresser, with an eye for classic clothing from fine department stores – dress shirts from Brooks Brothers, suits from Halls. He always look impeccably neat and pulled together. I’d like to think I had a bit to do with it from those first outfits from Marshall Fields and Harrod’s. 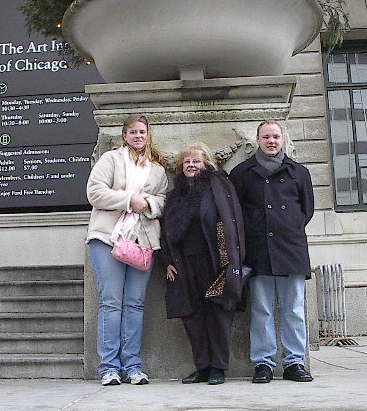 A couple of years ago Nick, Katie, my Mom and I went to Chicago for the weekend to go Christmas shopping. We had the best time. We didn’t just shop – we went to the top of the 95th of the Hancock Building, to the Chicago Art Institute, had Chicago pizza at Uno’s, martinis (by that time they were 22 and 21) at the Grand Lux Cafe and brunch at the Ritz-Carlton. And we went to Marshall Fields. The other day I was in the car with my Mom and my niece Elyse, doing some “strategic strike” shopping as Elyse calls it, and we were talking about social media – Facebook, Twitter, blogging and more. I mentioned my idea for this blog, and they both got really excited about it. Elyse said, “Call it the Do’s and Don’ts of Aunting” – and tell about all of our trips, adventures and fun times!” And then she started rattling off some “Do and Don’t” examples and we all started laughing and having fun with just the handful she named. So I’m going to start this blog with a “Don’t” in honor of Elyse. Elyse is getting ready to start high school at the end of this summer having graduated from 8th grade this past May. It was the start of grade school as a kindergartener that this particular story happened. During her school Christmas pageant, it was tradition that the kindergarteners all marched in from the back of the church as animals. Having some moderate seamstress skills, her mom asked me to whip up a costume – and Elyse wanted to be a puppy. How hard would that be? I went and bought a really cute puppy pattern, two colors of furry material and some Velcro. The suit was a breeze to make, but the headpiece, which was basically a bonnet to carry the ears, was a bit more challenging. I thought it looked cute, sort of like a basset hound (don’t think that was the puppy she had in mind nor even knew at the time what breed that was!) and excited to see what she would think of her finished costume when I dropped it off the night before. Well take a look at the picture; the ears were a little too long and floppy. (The Velcro didn’t exactly get in alignment when she put on the costume.) And when she walked down the aisle with the other kids, her puppy suit could have been mistaken by some as a donkey, but surely they would know she was a puppy, right? 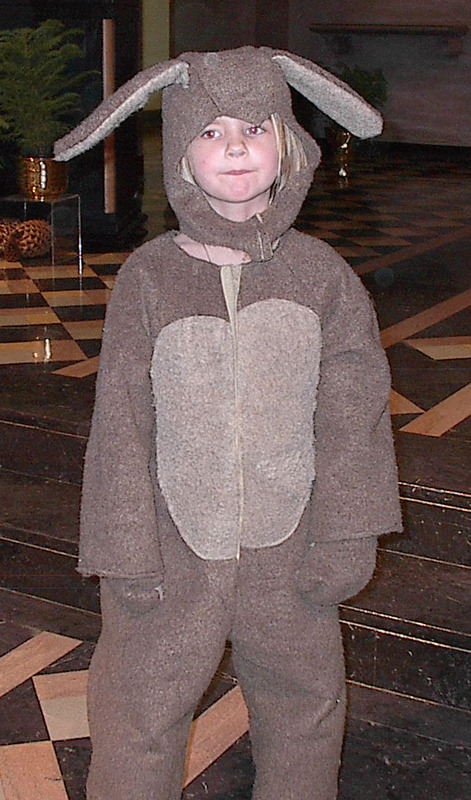 Elyse doesn’t let people get to her, and doesn’t take anything from anybody, so when she got a few “that’s a cute donkey suit,” or “wow Elyse, why did you want to be a donkey, I thought you were going to be a puppy” comments, she didn’t let it bother her. But I’ve heard about it every year since then, as she had eight more Christmas pageants, where all the new kindergarteners would march in wearing their costumes reminding her of that donkey suit with the silly ears that she had to wear. But as always, she was one of a kind, and no one else – that year or the remaining eight years of grade school – was ever a donkey! And what a cute donkey she was!